When the US Army responded to the threat of roadside bombs and attacks from urban rooftops by adding significant armor to the fleet of tactical vehicles, the military found that the gun turrets, became much heavier and harder to operate. The gun turret, now weighing more than 1,300 lbs. became almost impossible to rotate even by the strongest soldiers. Control Solutions LLC quickly developed a complete battery-operated system with a gear motor integrated into the turret ring, a rugged variable-speed DC motor controller and a joystick slew actuator. 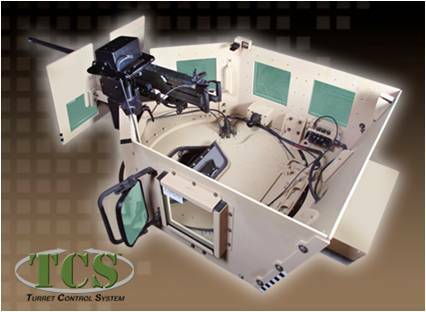 The Turret Control System (TCS) is the military’s field-proven solution that enhances vehicle gunner survivability. With continued innovation, the TCS product family reduces gunner fatigue and offers the ability to control the heavy armored gun turret while keeping eyes on the mission and hands on the weapon. The latest TCS innovation is a weapon-mounted thumb controller in addition to the joystick actuator. The TCS has been fielded on over 60,000 HMMWV, MRAP and JLTV vehicles with the Battery-powered Motorized Traversing Unit (BPMTU) and the Improved Turret Drive System (ITDS). It’s not just a slogan, it’s what we do! Control Solutions LLC is your one-stop integrator for tough motion control problems. Our team of engineers and ISO-certified manufacturing facility stands ready to quickly design and manufacture an innovative solution for your application.